ARBA was hatched as an innovative technological idea. The success of Amazon.com and other online retailers had proven that people would buy online. 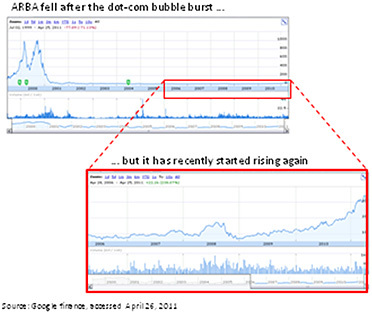 However, the dot-com bubble burst, driving ARBA’s stock price down toward $10 a share, from over $700. The hotel ballroom was like a rock concert, the stage lit, our ears ringing as the music died down. The 1,000 strong audience of techies and purchasing managers quieted down as Ariba’s CEO took the stage. He smiled knowingly at the audience, raised his hands and shouted, “Ariba … mas rapido!” (“upward … faster!”). The crowd broke into applause. This was 2000, at the peak of the “dot-com” boom. Ariba (ARBA) had just gone public and its stock price had shot up 400% to nearly $800 per share in less than six months, creating millionaires of those associated with the company. ARBA was hatched as an innovative technological idea. The success of Amazon.com and other online retailers had proven that people would buy online. Now the online purchasing wave would hit commercial spending where the advantages were even greater. ARBA had a solution that enabled companies to funnel their purchasing of indirect goods, like office equipment, online. This gave companies greater bargaining leverage over vendors and enabled them to negotiate lower prices, thereby saving millions each year. And ARBA was ahead of the game. Toward the end of that year, however, the dot-com bubble burst, driving ARBA’s stock price down toward $10 a share, from over $700. For the next nine years, ARBA’s stock price has not ventured far from that price point. But it has recently started rising again. ARBA’s journey offers several tangible lessons you can use to guide your business. To help you understand these I spoke with the company’s president, Kevin Costello. When the dot-com bubble burst, Ariba revisited its strategy. Its value proposition remained fundamentally sound–by helping companies shift purchases online it could help companies save money. But it was clear that the transformation driving the dot-com bubble was going to take longer than investors and entrepreneurs wanted to believe. So Ariba expanded its offerings, helping companies gain greater visibility into their spend, introducing electronic invoicing, developing a service to help customers generate return on investment (ROI) through purchasing improvements. Around 2005 the company stumbled upon the concept we now call “cloud computing” or “software as a service” (SaaS). To help its customers make purchases, Ariba had built the Ariba Network, a platform on which thousands of vendors sold everything from electric calculators to servers. Ariba customers bought from these vendors by logging on to the Ariba solution their company had installed throughout the company’s computer systems. But then it occurred to Ariba: why limit access to the Ariba Network to existing customers who had spent millions of dollars to implement the Ariba purchasing solution? Why not let non-Ariba customers log on to a web site and buy from these vendors? They would not enjoy all the benefits that traditional Ariba customers enjoy, but they could buy what they needed more easily and at a lower price. So Ariba began adjusting its product to help corporate customers enjoy the same benefits consumers have come to expect. While 15 years ago, purchasing a TV could be a several-day process that included driving around to five or six stores, today it takes just two hours online. Ariba realized they were ideally positioned to bring the same experience to the corporate user. Today the Ariba Network has over 500,000 participants. They conduct $170 billion in transactions over a 12-month period. Ariba’s stock price has grown more than 300% since early 2010. 1)Don’t confuse missed timing with missed vision: sometimes we get the vision right but misestimate how long it will take to realize the vision. Things turned out pretty much as we expected during the dot-com boom. Commerce HAS shifted dramatically from off-line to online, radically accelerating the pace of business. It just took ten years longer than the market anticipated. 2)Look for the rise in the fall: were it not for the fall of ARBA’s stock price to $10 from $700, the company may not have been forced to revisit its strategy and realize the potential of the Ariba Network. 3)Build the snowball: opening up the Ariba Network to a broader buying base through a SaaS solution turned it into a snowball. The more buyers it drew in, the more vendors it drew in, which in turn attracted more buyers. 1)If it ends up taking three times as long to achieve our vision, what would we do differently today? How can we make sure we don’t give up? 2)Imagine our core business fails. How else would we create profit from the assets and activities that compose our business? 3)What is the kernel of our snowball?